Australia did not need to win, and India never really thought seriously about doing so. A curiously muted final day of the Boxing Day Test petered out with four overs still to bowl; on recent evidence more than enough time to winkle out the visitors' last four wickets. A draw was enough for Australia to regain the Border-Gavaskar Trophy under the stand-in captaincy of Steven Smith, and also enough for MS Dhoni's India to avoid a series whitewash. So hands were shaken, backs slapped and stumps drawn. Despite the odd moment of rancour - Virat Kohli versus Brad Haddin - or transcendence - Mitchell Johnson's ripping cutter to bowl Cheteshwar Pujara - this always seemed the most likely result. It was a revealing day for Smith, showing that in his second Test as leader he was unprepared to risk a 2-0 series lead over opponents who had chased boldly and capably until tripping up within sight of the finishing post in Adelaide. In this, Smith showed a level of pragmatism more in common with another former captain who bowled leg spin in Richie Benaud, as opposed to the greater gambling instinct of Michael Clarke and his mentor Shane Warne. Right from the start of the day, Smith had appeared intent on making sure India would not be presented with too amenable a target on what always remained a friendly batting surface. India's captain MS Dhoni seemed to be hoping just as much for a closure early in the morning session, affording his batsmen the chance to pursue a target in the region of 350. But the hosts pushed on, Shaun Marsh advancing to the cusp of a third Test century when he chanced a quick single to mid-off and was thrown out by Virat Kohli's direct hit. When the innings was closed with Australia's last pair of Nathan Lyon and Josh Hazlewood at the crease, it was the coach Darren Lehmann, not Smith, who waved them in. Still, 70 overs was a not completely insubstantial amount of time. 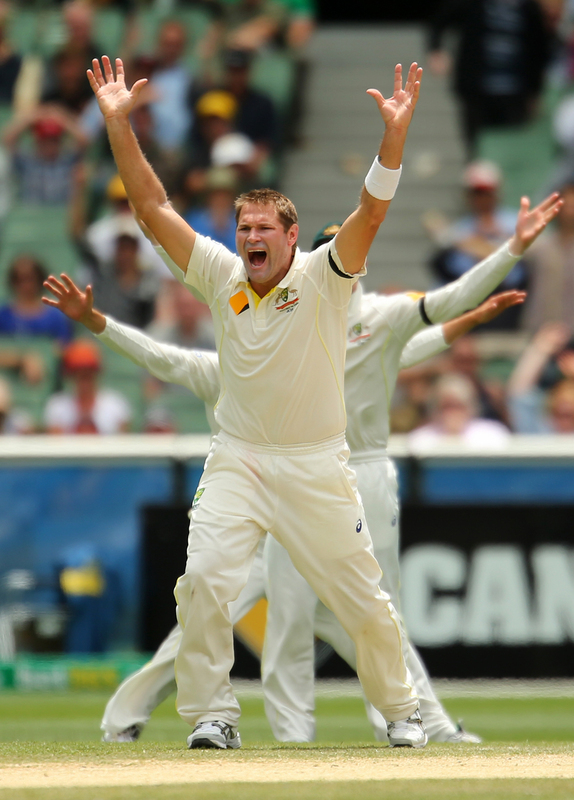 Ryan Harris struck with his second ball, finding late swing to pin Shikhar Dhawan in front of the stumps. KL Rahul was unexpectedly promoted to No. 3, but completed an unhappy match when he hooked convulsively at Mitchell Johnson and was held by Shane Watson, jogging back from first slip. M Vijay fell to the first-change Josh Hazlewood soon after, struck in line though the ball appeared likely to be sliding past leg stump. Kohli had made only four when he was almost run out - David Warner's excellent diving save devalued somewhat by a throw not accurate enough to strand Kohli as Haddin ran in to collect. The first verbal confrontation between Kohli and Haddin caused India's No. 4 to complain to the umpires, while Haddin goaded him with a series of exaggerated handclaps. Not quite as fluent as they had been in the first innings, Kohli and Ajinkya Rahane were helped by the ball losing some of its earlier hardness. Each had close calls, Harris raising an lbw query against Kohli and a fiercely struck Rahane cut shot bursting through the fingers of Chris Rogers at backward point. India managed to reach tea without further loss, but that achievement was made moot when Kohli flicked a little too hastily at Harris' first ball of the evening session and arrowed it straight to Joe Burns at square leg. Pujara had been dropped down the order as something of a safety blanket, and his 95-ball union with Rahane was enough to dim Australian hopes. Johnson had to conjure the ball of the Test to find a way past Pujara, his fast offbreak the stuff of Derek Underwood's wildest dreams, but there was not the same purchase for Lyon, and the other pacemen lost penetration as the day wore on. Rahane's mistimed pull shot to square leg left a narrow window open, but R Ashwin and Dhoni looked secure enough to leave Smith thinking he had run out of time four overs before he actually did so. An enjoyable and well-attended match had thus faded away. The series is Australia's, not in the sort of circumstances that prompt wild celebrations, but more the sober handshakes in recognition of a job completed. Features What is 24 balls more?